It was in the Lac d'Annecy, by the way, that "September Morn" was posed, and in the town that "September Morn" was painted. 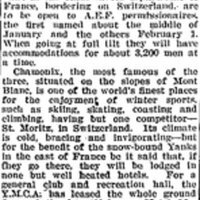 Although the original model has long since fled, the effect of her stay has been to give Annecy a much warmer climate than Chamonix and St. Gervais. This item, because of age, is in the public domain. The image comes courtesy of American Memory from the Library of Congress. The Stars and Stripes, "New Leave Centers in Winter Paradise," in September Morn Archive, Item #65, http://septembermorn.org/items/show/65 (accessed April 21, 2019).